Comoros is a group of three volcanic islands which are located between East Africa and Madagascar in the Indian Ocean. Nzwani (Anjouan), Mwali ( Moheli) and Ngazidga (Grand Comore) are their names. There is a fourth Island named Mahore (Mayotte) but it still belongs to the French, although the people of Comoros claim it as their own. The name Comoro comes from the Arabic word qumr meaning “moon” however the residents call their country Masiwa, simply, “the Islands”. The Islands are blessed with beautiful beaches and with quaint villages that dot the countryside. Each island is unique in its natural characteristics and attractions. The nation’s capital, Moroni, located on Grand Comore, is said have intoxicating Arabian charm. Moroni translates as “in the heart of the fire.” She sits at the foot of Mount Karthala, an active volcano that erupts about every 11 years. There you will also find the grandiose, Vendredi Mosque. Only males are allowed to go inside this holy mosque. The men must be dressed in full length trousers and must have washed their feet before entering the mosque. The Islands were colonized by Africans in the eighth century. Islam was introduced back in the 11th century. Today Sunni Islam is the national religion and practiced by 98 percent of the population. The Comoros Islands for centuries were a major stopover of mercantile routes and played a major role in the world’s economy. The French colonized the islands in 1886 and they remained under French rule until 1975. The Islands have been victim to many coup attempts since her independence from France. With the aid of other countries and the African Union, the government in 2001 signed a new constitution where the Islands were granted greater autonomy and are now considered to be somewhat stable. The most common language is Shikomoro, a Swahili dialect, however French and Arabic are widely spoken. All three are considered official languages. Comorians receive a Koranic education and learn to write their language in Arabic characters. Formal education is given in French and the literacy rate has improved in recent years and is now up to 75 percent. These Islands are poor, with 60 percent of the population living below the poverty line and they rank 184th in Gross Domestic Product, making them one of the poorest nations on earth. They import rice and other food stuff, consumer goods, petroleum, cement and transport equipment. They export vanilla, ylang-ylang, cloves and copra. Agriculture is 80 percent of the Islands’ work force. Fishing and tourism are becoming growth sectors of their economy. The staple ingredients in their cuisine are rice and cassava, seafood, fresh and dried plantains, and coconuts. Castrated goat is served for special celebrations on the Islands, which are mainly religious observances. They also celebrate two New Years in Comoros. 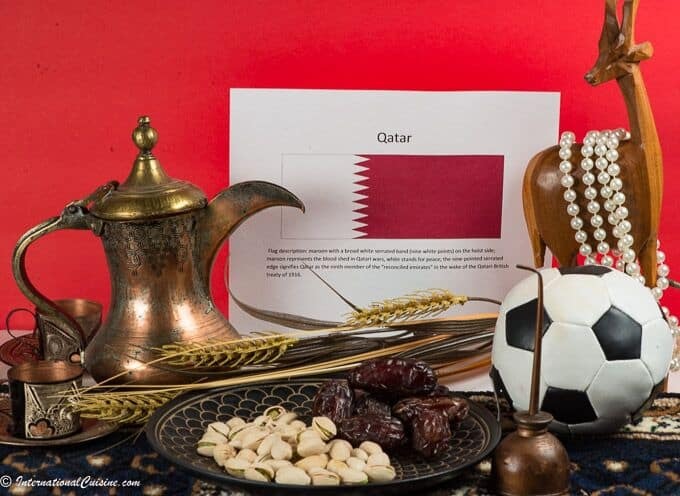 The first is the traditional New Year on January 1st and the other follows the Islamic calendar. They celebrate their Independence Day on July 6. These festivals include music, dancing and cultural performances, which recreate popular and important literary texts, including war epics and tales from the villages. Of course the festivals showcase their very best food. As I looked into the cuisine of this archipelago nation, I decided cooking something from the sea would be most fitting. (Besides, I didn’t want to think about castrating a goat.) The influences on their cuisine are French, African and Arabian. The religious influence is major as well. 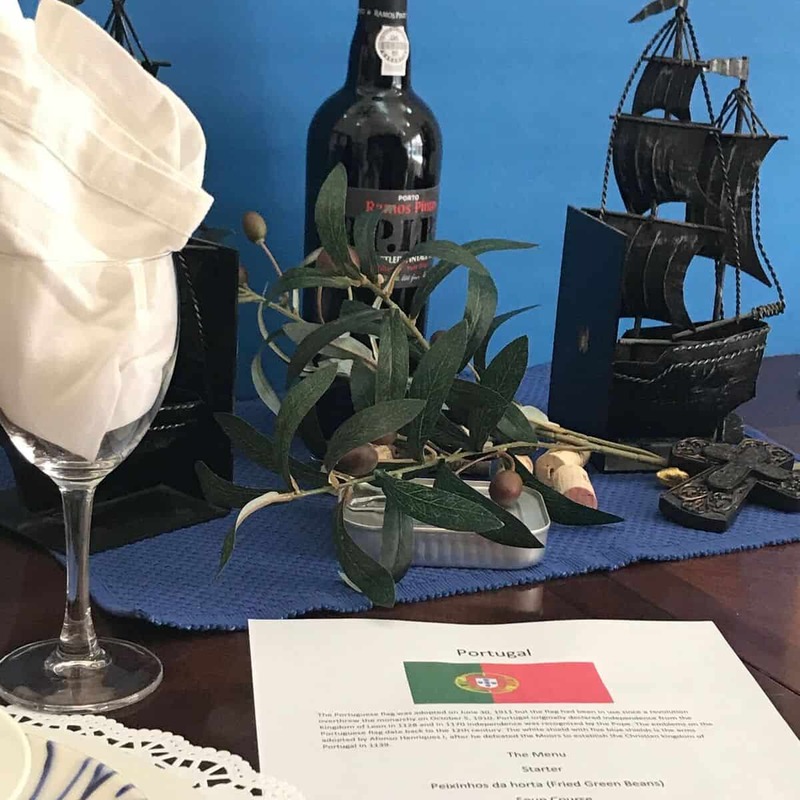 Although alcohol can be found in some European restaurants and tourist locations on the Islands, most Comorians do not partake. 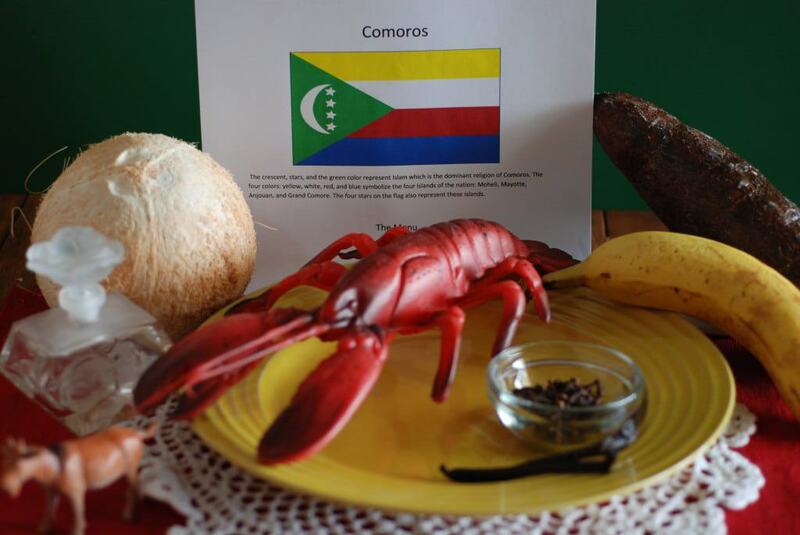 We set the table with the many colors of the Comoros flag; green, yellow, white, red and blue. We lit a ylang-ylang candle which emitted a lovely floral scent. In Comoros, it is proper to say “bismillah” (thanks to Allah) before eating. We began the meal with a really special sweet pea soup. 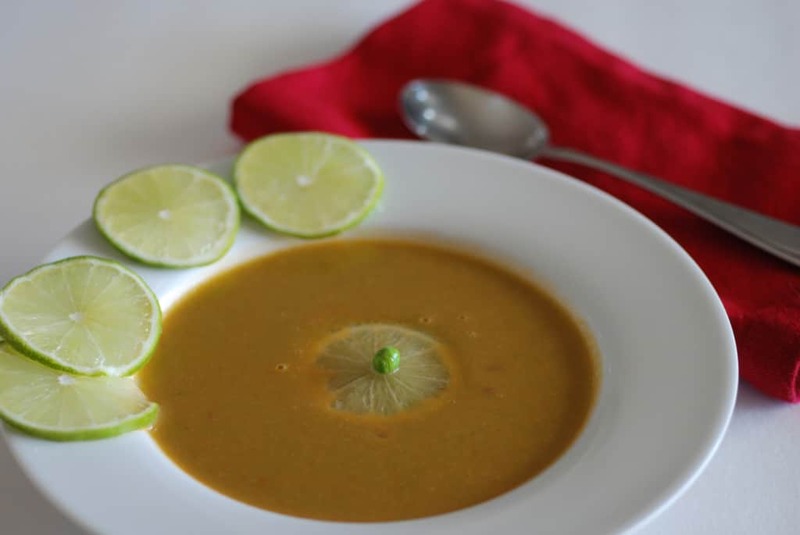 It had some spiciness from the cayenne and ginger and was made creamy with a light coconut milk. We loved it and I think I will have to add this to my favorites list. 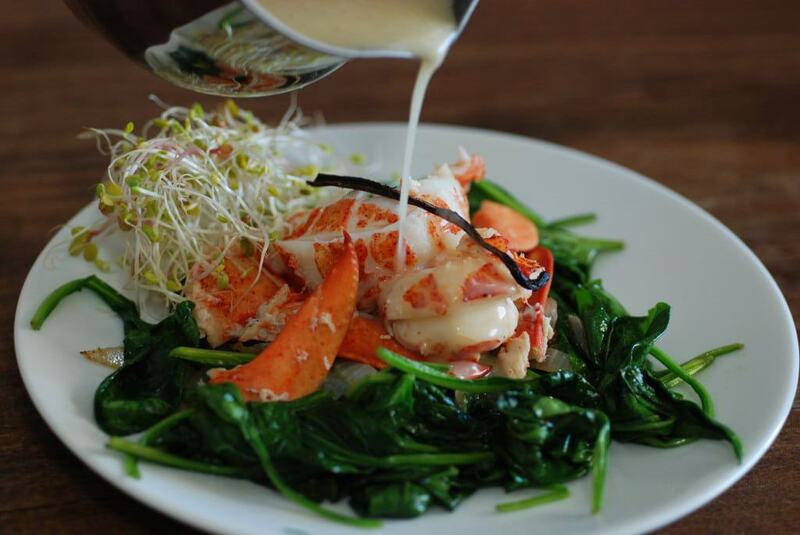 For the main course, we savored the lobster with vanilla butter sauce. We were both surprised at how delicious the vanilla was in the butter. The lobster was served over some lightly wilted greens and clover sprouts, which were a lovely accompaniment. We found ourselves pleasantly satisfied, as the meal had a delightful richness to it. Dessert is not too common in Comoros but they do enjoy fresh fruit, especially jackfruit. Jackfruit is a tropical fruit, known as the largest tree-borne fruit, weighing as much as 80 pounds (36 kg). I couldn’t find any fresh jackfruit but we did find it in a jar. 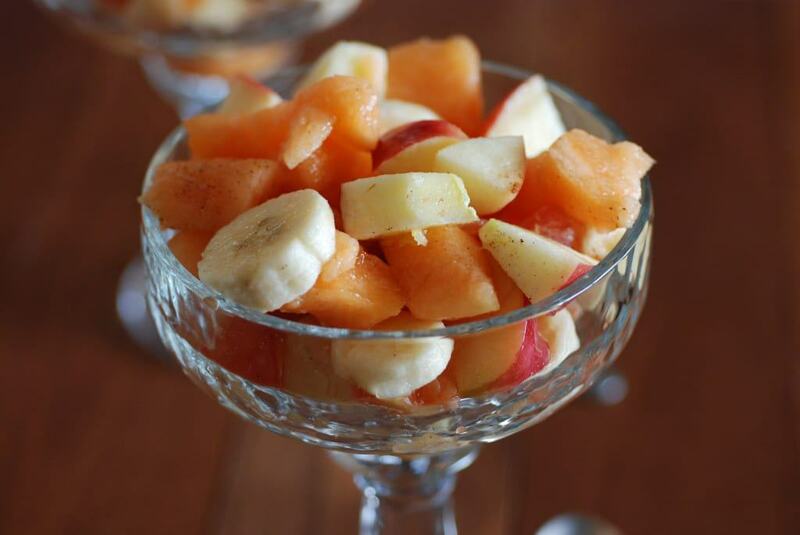 We mixed it with apples, bananas, oranges and melon. A light sauce was made from cinnamon and vanilla, which accentuated the fruity flavors. All in all, we were very happy to have journeyed to Comoros. You can win a woman with lies but you cannot feed her with lies.